At A.C. Whyte we recognise that customer satisfaction can only be achieved by providing a service that totally meets, or where possible exceeds, our clients’ requirements and expectations. A.C. Whyte & Co. Ltd is an established, experienced main contractor delivering major refurbishment and external wall insulation projects throughout the UK. We work with Local Authorities and Housing Associations to transform communities, with projects ranging from £10,000 to £6m. We have a dedicated, directly employed, fully trained NVQ Level 2 workforce of over 160 and an experienced Management Team is appointed to every project, which is how we guarantee exceptional workmanship and commit to delivering quality as standard. We are highly efficient, organised and proud of the fact that we have never had any contractual claims or disputes. We specialise in all areas of major refurbishment and the upgrades are designed to maximse energy efficiency. Our services include fabric repairs, roughcast, render, insulated render, roofing, cladding, installation of new windows, doors and UPVC fascias and soffits, joiner and plumbing works. 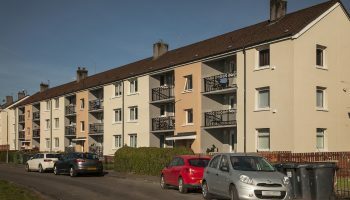 We were one of the first companies in Scotland to install an external wall insulation system over 30 years ago and our expertise has made us one of the top quality installers in the UK. We also support our clients to access government funding were upgrades will improve energy efficiency and can offer a fully managed service. 1973: A.C. Whyte (Slaters & Plasterers) Ltd established. 1987: Installed the first ever external wall insulation system in Scotland. 1990: Attained approved applicator status for a number of specialist external wall insulation and Render Systems, which became the core activity of the company. 1995: Company increased main contracts works to include all external fabric repairs. 1996: Received accreditation to BS EN ISO 9002 standard. 2003: Received accreditation for our Quality Management System to ISO 9001: 2000 standard. 2003-2008: Steadily increased turnover in Social Housing Market to approximately £13 million in 2006 and 2007. 2009-2010: Despite the recession, turnover increased from 2009 to 2010 by over £1 million. 2011: Received accreditation for our Quality Management System to ISO 9001:2008 standard. Instigated Environmental Management System gaining accreditation to ISO 14001:2004 standard. Commissioned and moved into new purpose-built 4,500sq ft premises. 2012: Achieved Green Deal Certification to PAS 2030 for the installation of external wall insulation. 2014: A.C. Whyte proudly celebrated our 40th anniversary. Looking to deliver a quality refurbishment project? Contact us to find out how we can work together.